Can anyone do full justice to a buffet spread? 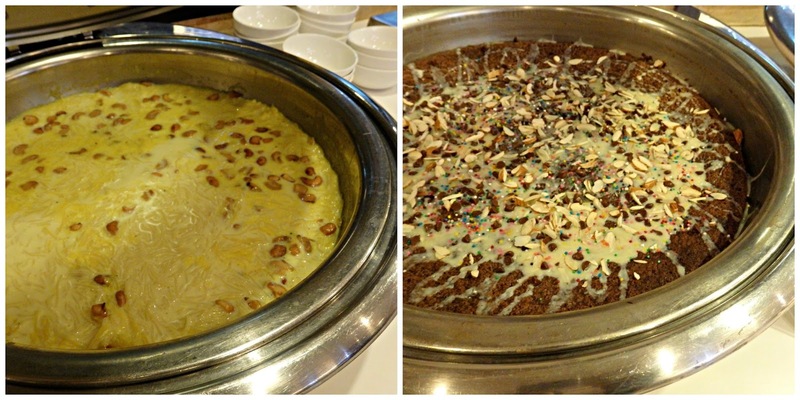 Which was my dilemma when I was invited to review Symphony's multi cuisine dinner buffet. Like me, there were other diners in the restaurant who lifted the lids of the cloches, looked in and either helped themselves to the contents or moved on to the next. Seventy seven dishes on the menu!! 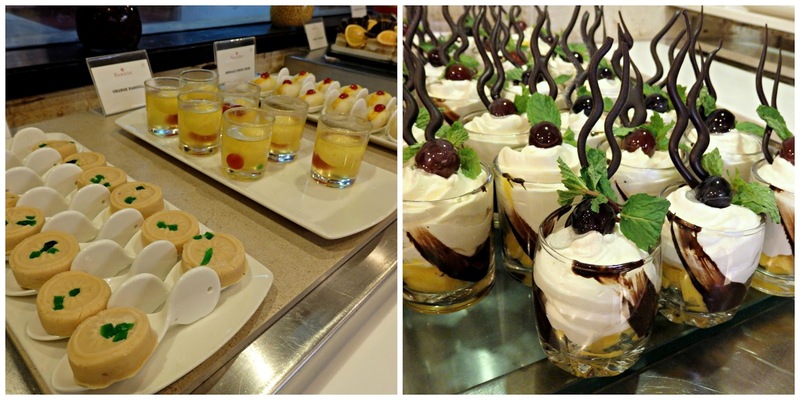 The problem gets a little more complicated when the dessert section comes into view. Now you realise the folly of piling your plate high with various salads and main courses. Then you compromise - you tell yourself you'll do an extra 15 minutes on the treadmill and possibly even skip breakfast the next day. Ramada Egmore Chennai has a wonderful location. It is close to the railway stations, the business district, government offices and of course, the Marina beach. At the entrance of Symphony is a group of figurines with musical instruments and a screen painted with more figures - a pretty musical welcome. The restaurant is a fairly large one. Buffet counters run all along one length of the room and in the centre, large displays of salads, appetisers and main courses. Occupying pride of place is the biryani and salna pots, definitely a must try. Soothing music plays over the sound system, reinforcing the name of the restaurant. Dining chairs with orange and cream upholstery and dark brown tables give the place a very contemporary look. 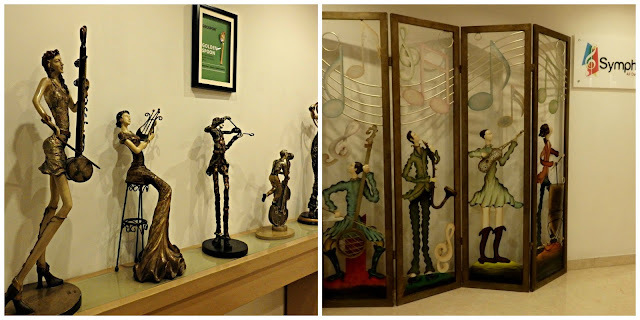 My son and I were led into one of the private dining rooms and we were joined for a short while by Group President Jaya Shankar Gupta who told us a bit about the hotel. We ordered our drinks - a particularly nice fresh orange juice for the young man and a musk melon for me. Soups came next - vegetable jade soup which was a little spicy and chicken mulligatawny which had a delicate flavour. I would have liked it more if the lentil base was smoother. Bits of coconut garnished the soup. 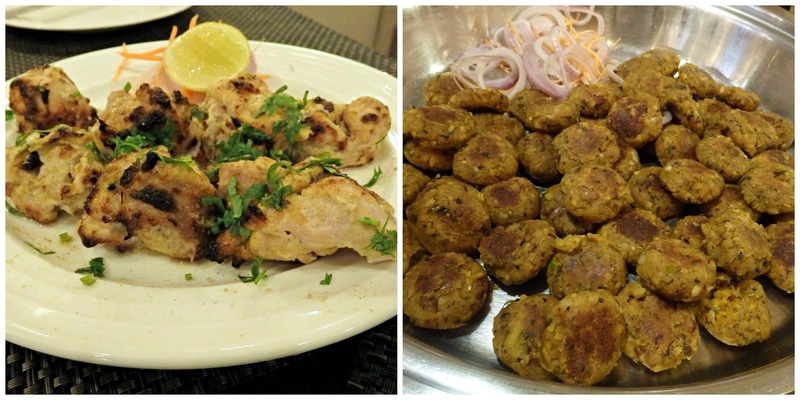 Our starter was going to be fried fish but we decided to skip it and had murgh malai kebab. It was succulent and full of flavour. We were also served an interesting almond kandhari tikki made with mashed yam and almond bits. Delicious. One other starter was kuzhi paniyaram made at a live counter. I normally stay miles away from anything that is oily but on this I couldn't see a drop of it. It was crisp outside, fluffy within and served with a tangy onion and tomato chutney. Yummy! 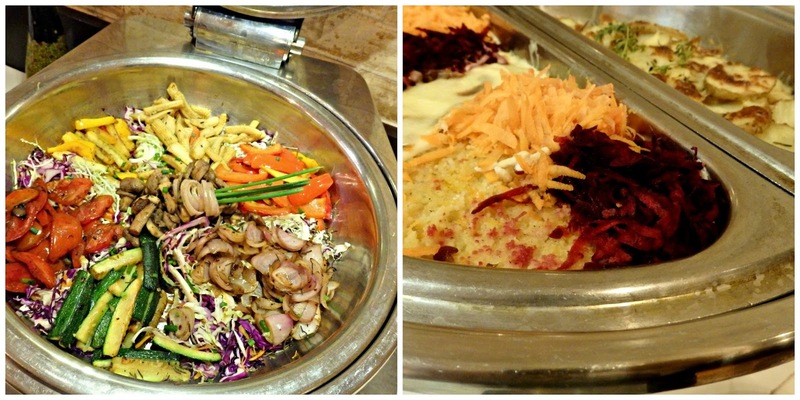 The salad display was mind boggling. Not just the salads per se but someone had got hold of a whole lot of fruits and veg and carved into them. See what I mean?? Beautiful, right? 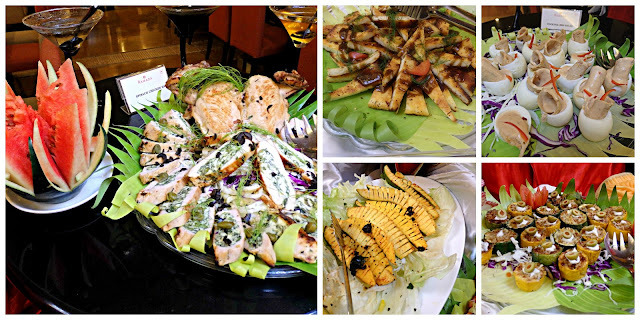 There were cups fashioned out of zucchini and stuffed with vegetables and cheese, the mango salad evoked memories of Chennai beaches, of course it was now being served in more hygienic environs! The cottage cheese salad with its balsamic flavoured topping was interesting but the cheese was hard and dry; leaving it uncovered was not helping its cause. A couple of Continental dishes caught my eye - there were sauteed legumes and polenta with herbed potatoes. Both were very nice, the vegetables had retained their crunch and the polenta with its cheesy topping was mild flavoured and well done. 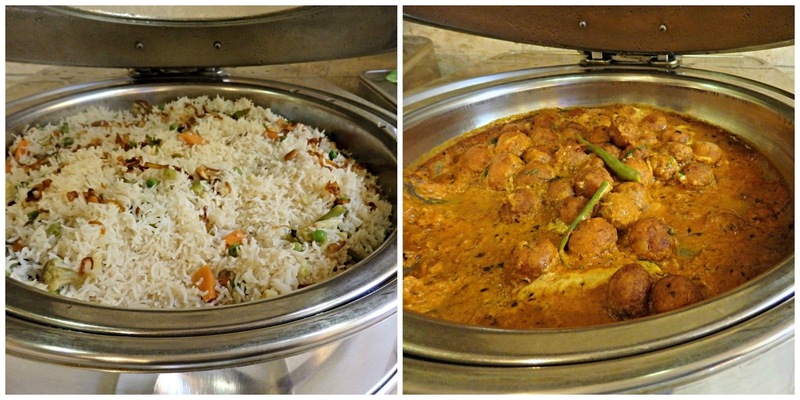 Plenty of choices for vegetarians as well - fragrant subzi pulao and paneer kofta curry made a terrific combination. There were noodles too but they looked quite dry and I was right. Lamb dum biryani was simply delicious. The chunks of lamb were fork tender and the rice itself, long grained and fragrant with the aroma of kewra, was perfectly spiced. Salna and the egg masala, along with a bowl of raita were the perfect accompaniments. There were more main courses on offer but I chose the interesting looking ones and I wasn't disappointed. The one thing I simply had to try was mamidikaya pulusu - a spicy raw mango and garlic curry. The plain rice served with it was quite dry but all was forgiven as it was a tangy, tasty combination. And spicy to boot! 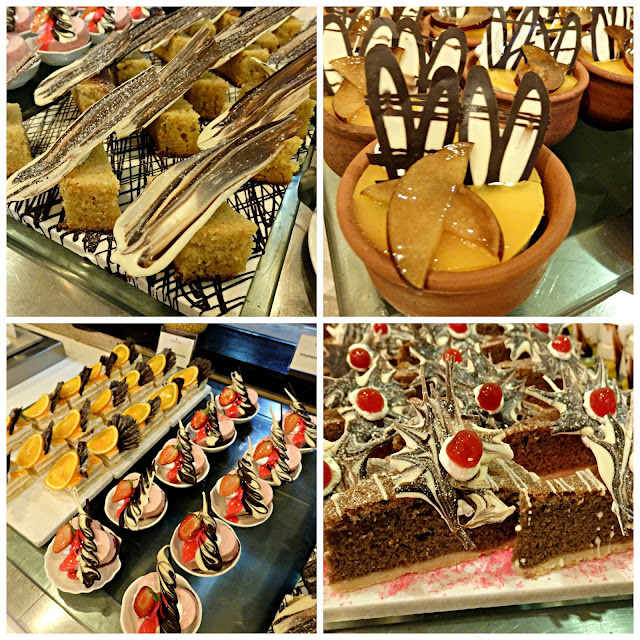 As for the desserts, there were far too many to taste so we shared a few. The chocolate pudding and the mango parfait got top points from the both of us. The rasagulla was a close second. What didn't impress were the cheesecake and the butterscotch mousse. There was too much setting agent in them which made them rubbery. Like ice creams? They have the cold stone variety too. Symphony has a long menu and the diner has ample choices. However, for me, it's the Indian section that was more appealing. Service was very good with plates and cutlery cleared and replaced quickly. Ramada Egmore Chennai is at Gandhi Irwin Road.The dinner buffet is 789/ per head, all inclusive. Do call 30004777 to make a reservation.